At 17, Tay was a typical teen trying to keep his grades up during the week, hanging out with friends and family on weekends, and enjoying life to the fullest. Then, in the blink of an eye, everything changed. Tay was a passenger in a car accident where he sustained injuries to his spine resulting in quadriplegia. Through the encouragement of many, and the intensive therapy and medical care of the Hospital for Special Care, Tay’s health stabilized and he enrolled in a local high school. 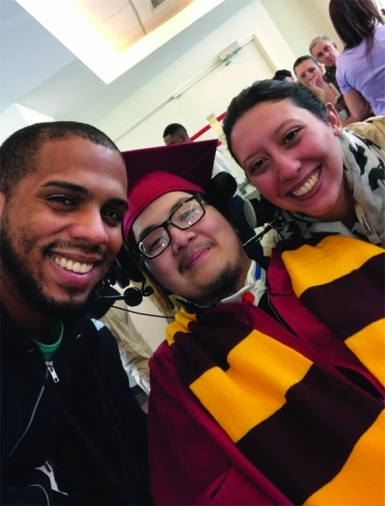 As he became stronger and was nearing graduation, now with straight A’s, he was referred to Money Follows the Person, a federal and Connecticut state program. Soon after, CCC Care Manager Lauren Papandrea and CCC Transition Coordinator Randell (RJ) Wilson became his care management team, helping him to lead a life of his own in the community. Tay now lives in a handicapped accessible apartment with his Dad who cares for him at night and a personal care assistant who cares for him during the day, ensuring that his needs are met. RJ helped Tay find the apartment and obtained help for him through the Rental Assistance Program (RAP) by filling out necessary forms and paperwork on his behalf and often times working through difficult logistics to accomplish the task. As care manager, Lauren is lead communicator and keeps the whole process moving smoothly for Tay, including arranging for his use of assistive technology and adaptive medical equipment, helping to manage his health by ordering supplies and scheduling appointments, submitting caregiver timesheets and coordinating work schedules. “We’re a team, all working to ensure that Tay is in the best position possible for success,” said Lauren. Tay plans to attend college to pursue a degree in Business and Finance. It is unthinkable that the alternative for this bright and eager young man would have been life in a hospital or skilled nursing facility. If you are inspired by Tay's story, donate to our organization here.